The efficient mixing volume range in a cone blender is between 35% and 75% of the blender’s total volume. The cone blender’s efficiency decreases if the low range is breached (-35%), but stops rapidly if the high range is breached (+65%). 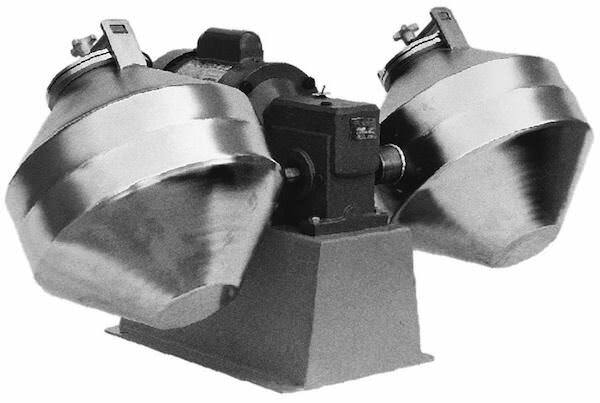 The Sepor Rotary Cone Blenders are excellent for blending of dry and semi-dry products. A wide variation of material types may be effectively blended, obtaining reproducible results. Over blending cannot occur. The cone blender will effectively blend fibrous materials and powder or granular materials. The Sepor 12 Inch Cone Blender is easy to operate, with ample feed and discharge openings is easily cleaned between batches and is economical. Power costs are very low and operator attention is required while blending is in process. 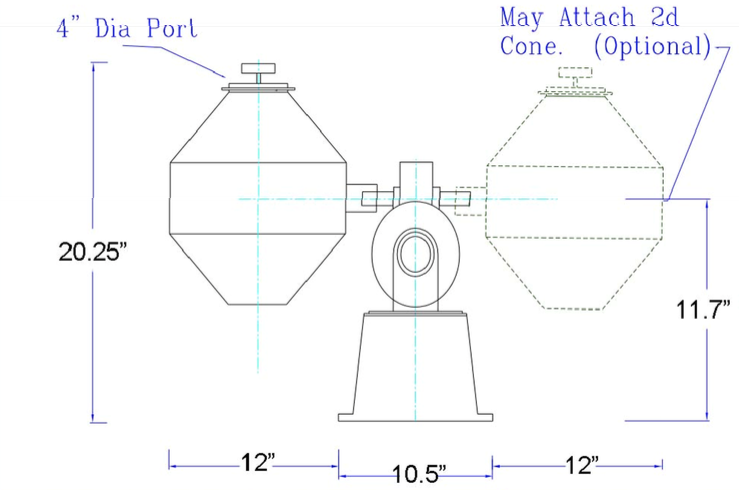 The cone vessel is comprised of two opposed cones, and a cylindrical center band, with each cone half welded in the center of the band. The center band has one oversize, machined trunnion, welded to it such as to provide an axis about which the vessel rotates. The angle of the cone is 45 degrees. The diameter of the center band is the cone blender size. The 12 inch cone blenders have a 12 inch diameter center band. 080D-001 Sepor 12 Inch Batch Cone Blender* 115V/1 Ph/60 Hz, 43 RPM 85 Lbs. 080D-002 Sepor 12 Inch Batch Cone Blender* 220 V/1 Ph/50 Hz, 47 RPM 85 Lbs. 080D-003 Extra Blender Cone with cover and gasket N/A 20 Lbs. 080D-004 Extra Neoprene Gasket N/A 1 Lb.